This is a side profile of his face. If you look closely, you can see his chin, lips and nose. The little dark spot is his eye. This is a picture of his hand above his little foot. Can you see his fingers and toes? Can’t wait to kiss them! This is another side profile of his face. He has his hand up to his mouth and it appears that perhaps he is sucking his thumb. Doesn’t his arm look HUGE in this picture?! Kelly said it looks like he is going to have Popeye arms!! I’m just hoping it is the angle of the camera or something…anything…we can’t have arms that big for obvious reasons, right ladies??? This is a picture of one of his little legs and foot (his foot is on the right side of the picture). His other foot is beside it although it isn’t very distinguishable here. The doctor said he now weighs about 2 to 2 ½ lbs. He is much more active now than he used to be and I can certainly tell that he’s getting heavier. This pregnancy sure seems to be flying by! I figure it will feel as if the days are creeping at a snail’s pace the closer I get to delivery but, for now, I can’t believe it is already December! Anyway, have a great weekend everybody! I know it has been a while since I posted anything, but all is well. We are doing great! 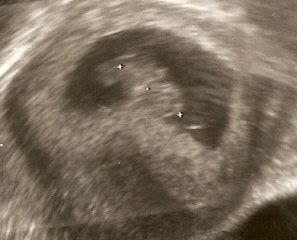 Kelly and I went for a sonogram November 7 and learned that we will be welcoming a BOY in late February early March!!!! So, if you haven’t already caught the name in the post title, our son will be named Simon Thomas Reynolds! (Thomas is Kelly’s middle name and is actually a name used on both sides of our family.) Everyone seemed to think it was going to be a girl, including Kelly, but there was no doubt about the gender of this little one! He wasn’t bashful at all! (Guess he’s already taking after his Daddy!) The doctor said based upon his size, etc. my due date could be anywhere from Feb. 27 to Mar. 7. Other than a rotten sinus bug I am still trying to get over, I have felt good. Simon is really moving a lot lately, mainly at night. I have been playing Jesus Loves Me for him at bedtime each night from this little wind-up lamb that his Gran Gran (Kelly’s Mom) gave him. Last night, he was kicking so hard and so frequently that the little lamb was dancing around on top of my stomach! I love feeling him move. We have gradually started working on the nursery. The crib is on back-order until the end of Dec. I am having a hard time finding bedding that I like. Well, I take that back, I have found some really cute crib bedding but I’m not paying the astronomical price for it! So, if anyone out there knows of any websites or stores that sell affordable crib sets please share them with me!! We are going back to the doctor in just a couple of weeks for our 3-D sonogram. Hopefully, we’ll get some good shots and I can post one or two next time. Until then, thanks for your thoughts and prayers and have a very Happy Thanksgiving! I know I personally have much to be thankful for! Passing this along... Please feel free to sign! Hey Everyone! There is a petition addressing the trial for Ryan Crick and Eric Gregory. Please check it out and sign it if you agree. Feel free to make comments as well. I do want you to know that this petition is not to be vindictive. It is simply for justice to be served. Please pass this petition around any way possible... email, facebook, etc. I celebrated my 28th birthday August 7. It was a blessing to be reminded of all the special family and friends I have who called, emailed and sent Birthday ‘happies’ to me. Thanks everybody!! Wednesday night Jade, Tara (our close friend from high school), her sweet baby boy Kane and I went to dinner to celebrate both of our Birthdays (Tara’s was on the 10th!) Then, Thursday night Kelly and I went to Anthony’s for my Birthday dinner. It is probably our most favorite restaurant and we hadn’t been in awhile so that was an extra special treat. Then Saturday night Kelly and I went to my parents for my family Birthday party. We had grilled steaks and all the yummy sides that go with it. So, as you can tell, I celebrated my big day in the best possible way…EATING!!! Did you know I was almost born inside a bank and then a car? Yep, according to my Mom she woke up that morning with ‘mild’ contractions but figured she really wasn’t in labor and went to work anyway. I guess since I was number two for her she thought she knew what to expect. (Apparently not!) She worked up until lunch before she finally decided that she might actually be in full blown labor! She had someone call my Dad while another co-worker took her home to get her suitcase. By the time my Dad picked her up and they got to the Dr.’s office she was almost ready to push. The Dr., not very happy with my Mom as you can imagine, told my Dad to take her straight over to the hospital ASAP. As luck would have it, their car wouldn’t crank!! My Dad said he was praying for the car to crank while my Mom was in the back seat praying too I figure! No doubt the prayers worked because they managed to get to the hospital just in time for me to be born. Now wasn’t that a sweet story??? I can’t believe I am almost 30. 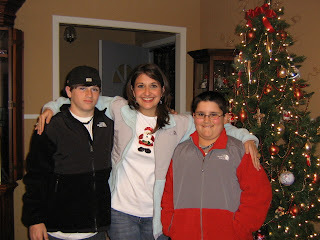 Honestly, where did the time go?? I always heard Birthdays come around a lot more frequently the older you get. Now, I think there just may be some truth to that! One of my sweet college friends, Conner, has recently started a new business, Swanky Britches. Check out these reversible cotton diaper covers on her new blog! What a neat idea! July has been a month to remember. 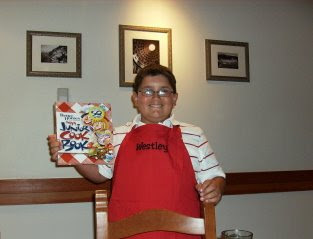 Westley’s 11th Birthday was on the 11th. Here are a few pictures of him at the family party. He went to culinary camp a few weeks ago. Cooking is his new favorite hobby, so among his gifts were an apron- so he could be stylish while in the kitchen- and cookbook- so he could make something really tasty and invite me over! I’m also a little behind in posting a picture of our new ride! After the car accident left our car totaled, we had to get something else. Kelly’s truck is about to bite the dust. It may have another year or so left on it, but not many. So, we were looking for something that I could drive for a year or so and then pass on to him. 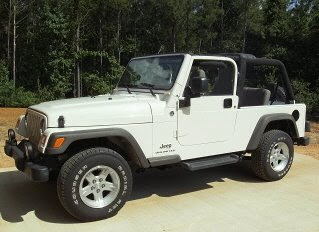 Kelly has always liked jeeps. I must admit that I was a little apprehensive about owning one at first, but I like it now. We’ve had some fun times in it and more to come no doubt! The cats seem to really like it as well! We have to put towels down in the seats at night when the top is off! Kelly and I went to the beach with Jason and Jade again this year. I’ll have to post a few pictures of our trip later. Until then, have a good rest of the week! Well, hello! I suppose for the very few of you who read this blog on a regular basis you likely have given up on me ever returning. I don’t blame you! Life has been very hectic for me since February, the last time I posted anything. Just to catch you up on what has been going on…Spring is an extremely busy time of the year for me with work. I was in Orlando, FL for a few days before leaving for Philadelphia, PA, where I spent seven days. I finally returned home and back to a normal work schedule, FINALLY! JonParker is growing like a weed, and we have had so much fun loving him since he arrived in January. His features seem to change everyday. He smiles a lot and makes sweet little sounds in an effort to ‘talk’ to us. He is sleeping through the night for the most part so his Mommy and Daddy are pretty happy about that! 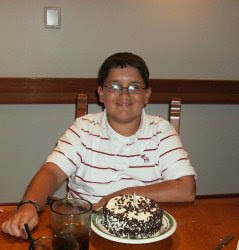 Brandon had his 15th birthday March 30. He now has his driving permit which is still hard for me to believe! We also celebrated Kelly’s 26th Birthday on March 18. Westley has been busy with baseball. April 15 marked a year of construction for us on the house. So, needless to say I am more than a little proud and relieved to announce that we are officially living here, in the new house! I know, can you honestly believe it!!? We spent our first night here May 9!! It is ironic how that happened. We had already planned to begin moving that weekend anyway. Our bedroom furniture was delivered that Friday morning. By Friday afternoon, the air conditioning in the old house went out! It DIED!!! The house was like an oven by 10pm. So, we got in the car and came up to the new house with nothing in it but the bedroom furniture! We have been here ever since. I suppose if the air conditioner had to bite the dust, that weekend was the best time! We are still very far from having everything in its place, but that will come with time. We get more and more accomplished each weekend it seems. I suppose you could say our priorities were changed for us too. On Memorial Day weekend, Kelly and I were in a car accident. To make a long story short, we were basically run over by two cars that were attempting to race down the highway. Kelly and I were in the right lane, and I was driving. I had just a few seconds to see them flying up behind us in my rearview mirror. They were trying to share the left lane. One of the cars apparently lost control and ran into us. Sending our car flipping into the air and back down onto the ground. We then slid off of the road and down into a deep ditch. The car that hit me also flipped and the second car got away somehow. We later learned from the accident report that the cars were going about 100 mph. According to several nurses at the hospital, racing down this particular stretch of hwy is becoming increasingly common as we weren’t the first ones they have seen this happen to. The driver who flipped along with us was “too intoxicated to give a statement” and arrested. To our knowledge, he wasn’t hurt. Of course, he also had NO insurance. I was discharged from the hospital the same day of the accident with a few scrapes and bruises, a jammed finger and some minor damage to my teeth. I now have a nice little row of braces on the inside of my bottom teeth. Yep, I sure never thought I would have to revisit the braces era but here I am! The orthodontist seems to think that I will only have to wear them for about 8 weeks. I hope he’s right! Kelly, on the other hand, wasn’t as lucky. He had to stay in the hospital for two days for a severe concussion, more than 30 stitches to the forehead and broken teeth. Needless to say the dentist has been our new friend over the past few weeks. There is no doubt that our guardian angels were with us that afternoon. I can’t help but think about how bad it really could have been. If there is ONE good thing that has resulted from that experience, Kelly now beats me putting his seatbelt on! So, to those of you who have read this long post, THANKS! I have honestly missed blogging and reading about everything that’s been going on in everyone’s lives. I am recommitting! Random Post of the Day! 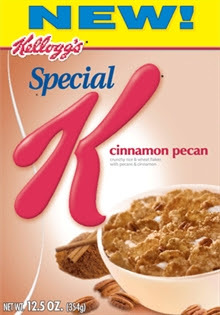 Has anyone else tried Kellogg's Special K Cinnamon Pecan cereal? I had it for the first time last night, and it is WONDERFUL! If you like cinnamon Toast Crunch cereal, you will love it! I consider this the healthy, grown-up version. The only problem is it comes packaged in such a tiny box! There just isn’t enough to last a full week in my house! It has definitely become a favorite for Kelly and I. Anyway, on a different note, two of my sweet friends have created family blogs! Take a moment to visit The Normans and The Lotts when you can. They will certainly be fun families to blog-stalk! :) Have a great day! Happy Valentines Day! Valentines is my second favorite holiday. I love everything about it. What it represents, the chocolate (of course), the pink and red hearts, the little paper valentines you exchanged in elementary school, the flowers, etc. Kelly and I had Valentine breakfast this morning after he got off work. This has become a tradition of sorts since he has had to work Valentine’s night for the past few years in a row. We had breakfast casserole and fruit & yogurt parfaits! Yum! I hope everyone reading this has had a wonderful day with someone you love. On a different note, I know I haven’t posted anything about our house in FOREVER!!!!!!!!!!! I promise to get some pictures up soon. As much as I would like to say that we are living there, we aren’t. :( However; I can honestly say that I am beginning to see the light at the end of this very long and drawn out tunnel. We lack minor things now such as installing the kitchen appliances, countertops and sinks, stair fixtures and two toilets. This has been a VERY VERY long process, but I know it’s worth it. The pictures above are of JonParker and his Favorite Aunt (Please disregard his expression indicating otherwise! )He was three weeks old yesterday and is continuing to do well. More posts to come! I’m so behind, I know. The past month has been extremely busy for us. Perhaps I can get back into the routine of things now. 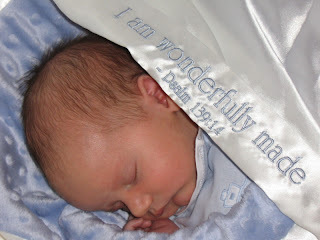 JonParker Fikes was born January 23 at 10:04 am weighing 6lbs 4oz. and 20 ½ in. He and Jill did great and are continuing to do so. We are all absolutely in love with him. I had to work in Jackson over the past two days, and I missed him terribly while gone. His big brothers are pretty smitten with him too! So far, he is sleeping and eating well. He is also really strong, already trying to lift his little head up! His eyes are dark blue right now. There is a debate among us about whether they will remain blue or turn brown. My brother-in-law and Brandon have blue eyes, and my sister and Westley have brown eyes. Brown is the more ‘dominant’ gene, so we figure they will turn, but they haven’t yet! Time will tell! Some of you may recall reading in a previous post about having another little Fikes in the family. What a blessing our family has received. Thank you Lord! Thank you! I got wonderful news this afternoon that an official date has been set for JonParker’s arrival! He will be here on January 23! I can not wait!!! Time will seem to creep so slow until then. Jill went to the doctor today, and everything looks great. I will be an Aunt of three in only a few more weeks!!! I hope everyone had a Merry Christmas and Happy New Year! I can’t believe it is 2008 already. It seems as if 2007 flew by so fast! Christmas was very busy hopping from one family function to the next, but it was well worth it as always. The top picture is of me, my sister, Mom and aunt. 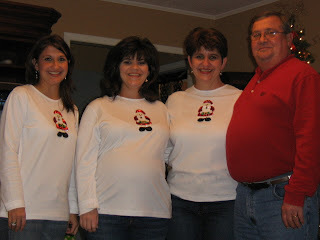 A few years ago, we began a tradition where we all wear matching Christmas shirts on Christmas Day. 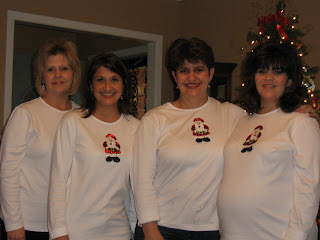 I am not really a “Christmas Shirt Wearing” kinda girl, but I make an exception one day a year. ;) The middle picture is of me, my sister, Mom and Dad and the final shot is of me and my nephews. Kelly had to work on Christmas Eve and Christmas Day, so I went to his Grandparent’s on his Dad’s side Christmas Eve night as well as my Grandparent’s on my Dad’s side. Then, I was at Kelly’s Grandparent’s house on his Mom’s side for breakfast Christmas morning and to my parent’s house for Christmas lunch. Then, we had Christmas dinner and Kelly’s parents. So, I kept the roads hot and ate until I thought I would explode! Kelly and I were in Memphis with the Gaskins for New Years. We went up early for the Liberty Bowl and stayed through New Year’s Day. We had a lot of fun bringing in 2008! Of course, I forgot my camera at home, so I don’t have any pictures to post. I generally always have New Year’s resolutions, but I honestly haven’t made any this time around…other than to get in our house before 2009 (I’ll save that for a future blog!). 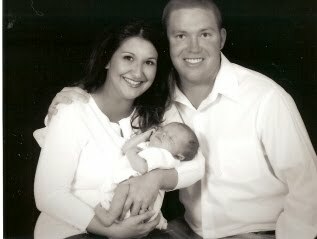 2007 was full of many blessings for which I am so grateful, having another nephew on the way and the construction of our new house are just a few! Kelly also has a new cousin on his side of the family and another on the way as well. We are looking forward to what the future has in store for 2008! From our home to yours, best wishes for a blessed new year!